During IVF, most patients will create multiple embryos and this will force a decision of how many to transfer at one time. 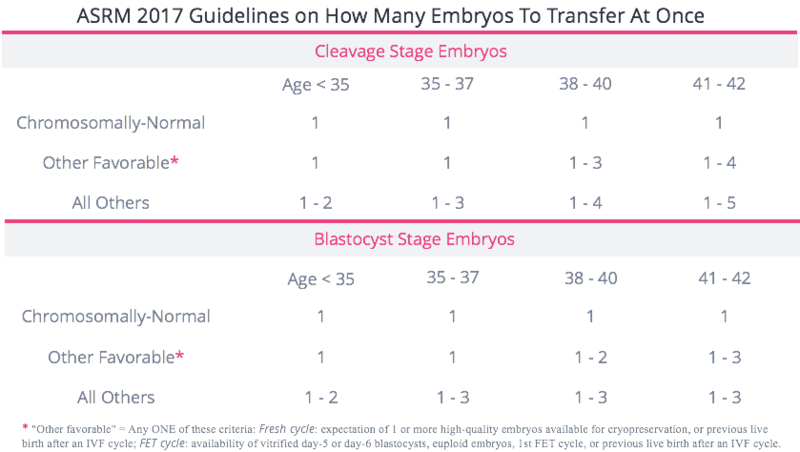 The data tells us that if a patient has two embryos, for instance, her success rate with those two embryos will be the same whether she transfers one embryo at a time (known as elective Single Embryo Transfer, or eSET) or both embryos at once. 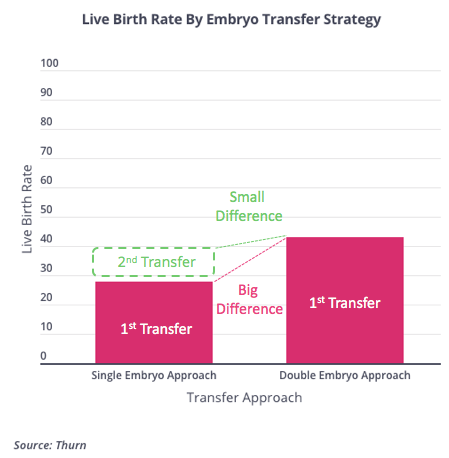 This is a point that requires continual highlighting: the decision to transfer embryos one-at-a-time or multiple-at-once does not change the odds the cycle will lead to a live birth. It does mean the patient having a double embryo transfer may require one fewer transfer to achieve the same result. As a result, that patient may become pregnant a month or two earlier and save roughly $3,000 (the cost of one transfer). This is not to be confused with the cost of a whole new cycle (roughly $20,000). However, if a woman who transfers two embryos at once does conceive, she is far more likely to carry twins-or-triplets (30%) than if she conceives having transferred one-embryo-at-a-time (1%). This is an especially big problem because multiple gestation pregnancies raise the risk to both mother and offspring. For this reason, many don’t believe taking on this level of risk is worth it just to save an additional transfer (at $3,000) and a month or two of time. 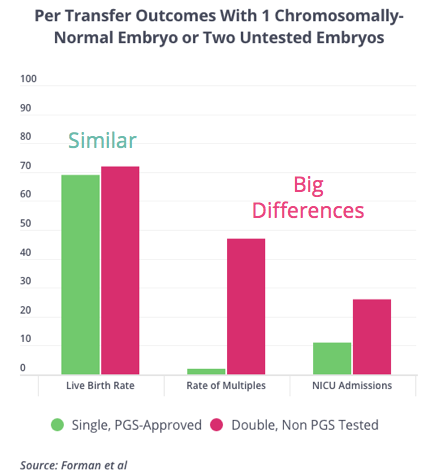 PGS genetic screening (which we cover in another lesson) proponents rightfully point out that when you test embryos, and transfer one chromosomally-normal at a time you you get the best of both worlds: the rate of success-per-transfer associated with two embryos and the risk of twins associated with transferring one. For myriad reasons, your clinic may insist upon transferring embryos that have only been grown to the “cleavage stage” (often known as Day 3 embryos), and not the “blastocyst stage” (often known as Day 5 or Day 6 embryos). 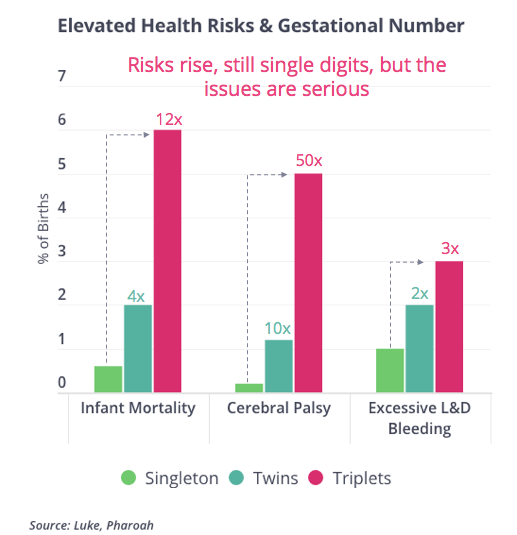 Cleavage stage embryos are less developed and have a lower-likelihood to lead to a live birth, and thus a lower likelihood to lead to multiple births. The American Society of Reproductive Medicine (ASRM) believes transferring multiple cleavage stage embryos is of lower risk than transferring multiple blastocyst stage embryos. 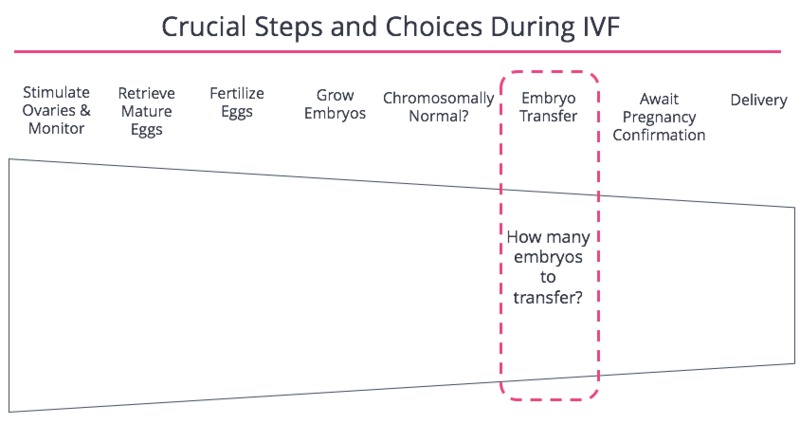 Thus, keep in mind the stage of the embryos you are transferring when determining how many to transfer. The American Society of Reproductive Medicine (ASRM) has guided doctors to limit the number of embryos they transfer. Should you, or your doctor, choose to exceed the suggested limit, we urge you to be clear with your reasoning and consider the additional medical risks you’re taking.